This article is about airfoils. For other types of foil, see Foil (disambiguation). Examples of airfoils in nature and within various vehicles. Though not strictly an airfoil, the dolphin flipper obeys the same principles in a different fluid medium. 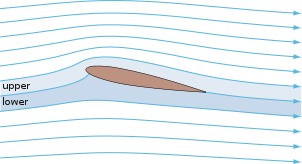 An airfoil-shaped body moved through a fluid process, produces an aerodynamic force. The component of this force perpendicular to the direction of motion is called lift. The component parallel to the direction of motion is called drag. Subsonic flight airfoils have a characteristic shape with a rounded leading edge, followed by a sharp trailing edge, often with a symmetric curvature of upper and lower surfaces. Foils of similar function designed with water as the working fluid are called hydrofoils. The lift on an airfoil is primarily the result of its angle of attack and shape. When oriented at a suitable angle, the airfoil deflects the oncoming air (for fixed-wing aircraft, a downward force), resulting in a force on the airfoil in the direction opposite to the deflection. This force is known as aerodynamic force and can be resolved into two components: lift and drag. Most foil shapes require a positive angle of attack to generate lift, but cambered airfoils can generate lift at zero angle of attack. This "turning" of the air in the vicinity of the airfoil creates curved streamlines, resulting in lower pressure on one side and higher pressure on the other. This pressure difference is accompanied by a velocity difference, via Bernoulli's principle, so the resulting flowfield about the airfoil has a higher average velocity on the upper surface than on the lower surface. The lift force can be related directly to the average top/bottom velocity difference without computing the pressure by using the concept of circulation and the Kutta-Joukowski theorem. 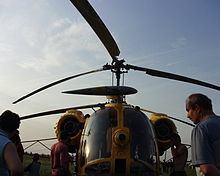 A fixed-wing aircraft's wings, horizontal, and vertical stabilizers are built with airfoil-shaped cross sections, as are helicopter rotor blades. Airfoils are also found in propellers, fans, compressors and turbines. Sails are also airfoils, and the underwater surfaces of sailboats, such as the centerboard and keel, are similar in cross-section and operate on the same principles as airfoils. Swimming and flying creatures and even many plants and sessile organisms employ airfoils/hydrofoils: common examples being bird wings, the bodies of fish, and the shape of sand dollars. An airfoil-shaped wing can create downforce on an automobile or other motor vehicle, improving traction. Any object, such as a flat plate, a building, or the deck of a bridge, with an angle of attack in a moving fluid will generate an aerodynamic force perpendicular to the flow. Airfoils are more efficient lifting shapes, able to generate more lift than similarly sized flat plates, and to generate lift with significantly less drag. A lift and drag curve obtained in wind tunnel testing is shown on the right. The curve represents an airfoil with a positive camber so some lift is produced at zero angle of attack. With increased angle of attack, lift increases in a roughly linear relation, called the slope of the lift curve. At about 18 degrees this airfoil stalls, and lift falls off quickly beyond that. The drop in lift can be explained by the action of the upper-surface boundary layer, which separates and greatly thickens over the upper surface at and past the stall angle. The thickened boundary layer's displacement thickness changes the airfoil's effective shape, in particular it reduces its effective camber, which modifies the overall flow field so as to reduce the circulation and the lift. The thicker boundary layer also causes a large increase in pressure drag, so that the overall drag increases sharply near and past the stall point. Airfoil design is a major facet of aerodynamics. Various airfoils serve different flight regimes. Asymmetric airfoils can generate lift at zero angle of attack, while a symmetric airfoil may better suit frequent inverted flight as in an aerobatic airplane. In the region of the ailerons and near a wingtip a symmetric airfoil can be used to increase the range of angles of attack to avoid spin–stall. Thus a large range of angles can be used without boundary layer separation. Subsonic airfoils have a round leading edge, which is naturally insensitive to the angle of attack. The cross section is not strictly circular, however: the radius of curvature is increased before the wing achieves maximum thickness to minimize the chance of boundary layer separation. This elongates the wing and moves the point of maximum thickness back from the leading edge. Supersonic airfoils are much more angular in shape and can have a very sharp leading edge, which is very sensitive to angle of attack. A supercritical airfoil has its maximum thickness close to the leading edge to have a lot of length to slowly shock the supersonic flow back to subsonic speeds. Generally such transonic airfoils and also the supersonic airfoils have a low camber to reduce drag divergence. Modern aircraft wings may have different airfoil sections along the wing span, each one optimized for the conditions in each section of the wing. Movable high-lift devices, flaps and sometimes slats, are fitted to airfoils on almost every aircraft. A trailing edge flap acts similarly to an aileron; however, it, as opposed to an aileron, can be retracted partially into the wing if not used. A laminar flow wing has a maximum thickness in the middle camber line. Analyzing the Navier–Stokes equations in the linear regime shows that a negative pressure gradient along the flow has the same effect as reducing the speed. So with the maximum camber in the middle, maintaining a laminar flow over a larger percentage of the wing at a higher cruising speed is possible. However, some surface contamination will disrupt the laminar flow, making it turbulent. For example, with rain on the wing, the flow will be turbulent. Under certain conditions, insect debris on the wing will cause the loss of small regions of laminar flow as well. Before NASA's research in the 1970s and 1980s the aircraft design community understood from application attempts in the WW II era that laminar flow wing designs were not practical using common manufacturing tolerances and surface imperfections. That belief changed after new manufacturing methods were developed with composite materials (e.g., graphite fiber) and machined metal methods were introduced. NASA's research in the 1980s revealed the practicality and usefulness of laminar flow wing designs and opened the way for laminar flow applications on modern practical aircraft surfaces, from subsonic general aviation aircraft to transonic large transport aircraft, to supersonic designs. Schemes have been devised to define airfoils – an example is the NACA system. Various airfoil generation systems are also used. An example of a general purpose airfoil that finds wide application, and predates the NACA system, is the Clark-Y. Today, airfoils can be designed for specific functions using inverse design programs such as PROFOIL, XFOIL and AeroFoil. XFOIL is an online program created by Mark Drela that will design and analyze subsonic isolated airfoils. The suction surface (a.k.a. upper surface) is generally associated with higher velocity and lower static pressure. The pressure surface (a.k.a. lower surface) has a comparatively higher static pressure than the suction surface. The pressure gradient between these two surfaces contributes to the lift force generated for a given airfoil. The leading edge is the point at the front of the airfoil that has maximum curvature (minimum radius). The trailing edge is defined similarly as the point of maximum curvature at the rear of the airfoil. , is the length of the chord line. That is the reference dimension of the airfoil section. Thickness measured perpendicular to the chord line. This is sometimes described as the "British convention". Some important parameters to describe an airfoil's shape are its camber and its thickness. For example, an airfoil of the NACA 4-digit series such as the NACA 2415 (to be read as 2 – 4 – 15) describes an airfoil with a camber of 0.02 chord located at 0.40 chord, with 0.15 chord of maximum thickness. The aerodynamic center, which is the chord-wise length about which the pitching moment is independent of the lift coefficient and the angle of attack. The center of pressure, which is the chord-wise location about which the pitching moment is zero. Thin airfoil theory is a simple theory of airfoils that relates angle of attack to lift for incompressible, inviscid flows. It was devised by German-American mathematician Max Munk and further refined by British aerodynamicist Hermann Glauert and others in the 1920s. The theory idealizes the flow around an airfoil as two-dimensional flow around a thin airfoil. It can be imagined as addressing an airfoil of zero thickness and infinite wingspan. on a symmetric airfoil, the center of pressure and aerodynamic center are coincident and lie exactly one quarter of the chord behind the leading edge. on a cambered airfoil, the aerodynamic center lies exactly one quarter of the chord behind the leading edge. is the angle of attack in radians, measured relative to the chord line. is the section lift coefficient when the angle of attack is zero. Thin airfoil theory does not account for the stall of the airfoil, which usually occurs at an angle of attack between 10° and 15° for typical airfoils. In the mid-late 2000's, however, a theory predicting the onset of leading-edge stall was proposed by Wallace J. Morris II in his doctoral thesis. Morris's subsequent refinements contain the details on the current state of theoretical knowledge on the leading-edge stall phenomenon. Morris's theory predicts the critical angle of attack for leading-edge stall onset as the condition at which a global separation zone is predicted in the solution for the inner flow. Morris's theory demonstrates that a subsonic flow about a thin airfoil can be described in terms of an outer region, around most of the airfoil chord, and an inner region, around the nose, that asymptotically match each other. As the flow in the outer region is dominated by classical thin airfoil theory, Morris's equations exhibit many components of thin airfoil theory. along the line, s. By the Kutta condition, the vorticity is zero at the trailing edge. Since the airfoil is thin, x (chord position) can be used instead of s, and all angles can be approximated as small. is the chord length of the airfoil. (These terms are known as the Glauert integral). ^ "If the body is shaped, moved, or inclined in such a way as to produce a net deflection or turning of the flow, the local velocity is changed in magnitude, direction, or both. Changing the velocity creates a net force on the body" "Lift from Flow Turning". NASA Glenn Research Center. Archived from the original on 5 July 2011. Retrieved 2011-06-29. ^ Croom, C. C.; Holmes, B. J. (1985-04-01). Flight evaluation of an insect contamination protection system for laminar flow wings. ^ Holmes, B. J.; Obara, C. J.; Yip, L. P. (1984-06-01). "Natural laminar flow experiments on modern airplane surfaces". ^ Hurt, H. H., Jr. (January 1965) . Aerodynamics for Naval Aviators. U.S. Government Printing Office, Washington, D.C.: U.S. Navy, Aviation Training Division. pp. 21–22. NAVWEPS 00-80T-80. ^ Houghton, E.L.; Carpenter, P.W. (2003). Butterworth Heinmann (ed.). Aerodynamics for Engineering Students (5th ed.). p. 18. ISBN 978-0-7506-5111-0. ^ a b Houghton, E. L.; Carpenter, P.W. (2003). Butterworth Heinmann (ed.). Aerodynamics for Engineering Students (5th ed.). p. 17. ISBN 978-0-7506-5111-0. ^ Phillips, Warren F. (2010). Mechanics of Flight (2nd ed.). Wiley & Sons. p. 27. ISBN 978-0-470-53975-0. ^ Bertin, John J.; Cummings, Russel M. (2009). Pearson Prentice Hall (ed.). Aerodynamics for Engineers (5th ed.). p. 199. ISBN 978-0-13-227268-1. ^ Morris, Wallace J., II (2009). "A universal prediction of stall onset for airfoils at a wide range of Reynolds number flows". Ph.D. Thesis. Bibcode:2009PhDT.......146M. ^ Morris, Wallace J.; Rusak, Zvi (October 2013). "Stall onset on aerofoils at low to moderately high Reynolds number flows". Journal of Fluid Mechanics. 733: 439–472. Bibcode:2013JFM...733..439M. doi:10.1017/jfm.2013.440. ISSN 0022-1120. ^ Traub, Lance W. (2016-03-24). "Semi-Empirical Prediction of Airfoil Hysteresis". Aerospace. 3 (2): 9. doi:10.3390/aerospace3020009. ^ Ramesh, Kiran; Gopalarathnam, Ashok; Granlund, Kenneth; Ol, Michael V.; Edwards, Jack R. (July 2014). "Discrete-vortex method with novel shedding criterion for unsteady aerofoil flows with intermittent leading-edge vortex shedding". Journal of Fluid Mechanics. 751: 500–538. Bibcode:2014JFM...751..500R. doi:10.1017/jfm.2014.297. ISSN 0022-1120. Anderson, John, D (2007). Fundamentals of Aerodynamics. McGraw-Hill. Batchelor, George. K (1967). An Introduction to Fluid Dynamics. Cambridge UP. pp. 467–471. Wikimedia Commons has media related to Airfoils and wing cross-sections.